This hotel was a steal as it was full of celebrities the weekend before with The Kentucky Derby. Two Queen sized beds were more than comfortable. The staff was ultra friendly. The location of the hotel being right on the Riverfront Downtown made it convenient to everything we wanted to visit, all within walking distance. The hotel was on the river right downtown, within easy walking distance to the the bars. The air conditioner's fan was noisy and did not stay on as I set it on the thermostat. The Galt House is a two-fold enigma: adjacent to one another are the Galt House East and the Galt House West. The Galt House East is the pricier and more modern of the two accommodations, but each holds its individual charm. Simply the magnificence of the two buildings and the decor itself is mind boggling. Regardless of which building a visitor calls home for an evening or two, the visitor will find themselves in the midst of a plethora of downtown activities, and on the edge of the Ohio River. The West Wing, the friendlier priced of the two, offers the standard one or two-bed rooms with a bath. Although a bit outdated, these accommodations are typically comfortable, with cable, wireless Internet available in many areas, varying views of the city or river, and coffee makers in each room. The East Wing consists mostly of suites and suite apartments. The suites are typically two large rooms with an adjoining foyer and a very ample shower bathroom in between. Suites include refrigerators, occasionally a microwave, and each suite has two large televisions with plentiful channels and movie rentals. 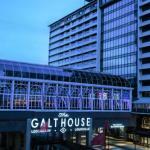 The Galt House offers a myriad of amenities, including close proximity to endless entertainment, eateries, fitness workouts, spas, pools, and 4th Street access. A lounge and bar area complete with an aviary and massive in-bar aquarium joins the two wings of the establishment. A multimillion dollar renovation in late 2006 produced a skywalk to the nearby Kentucky Convention Center, and sought to mend some aging provisions in the West Wing. The rotating Flagship Restaurant is famous for its breathtaking view, complimented by the comfortable simplicity of the Fountain Room, which offers a plentiful buffet at a friendly price. The Galt House offers outdoor pools, copious amounts of conference rooms, and creative seasonal themes. This Louisville landmark is a favorite hotel of many tourists, although not everyone would agree with their opinions! Ongoing renovations and some age-challenged fixtures in the west wing may turn away some tourists. However, these aged factors add to its charm. The West Tower just oozes with antiquity that is charming enough to help most visitors overlook some maintenance deficits. There is a unique ambiance in either wing of the huge amenity that is unlike any other hotel. Check out specials around the holidays -- especially Christmas. The hotel is near abandonment right at Christmas, which can provide a price efficient and special holiday for a family. Other times of the year may expose visitors to elevator delays, large volumes of students, and convention center visitors. Parking: Yes, there is parking. Unfortunately overpriced at $9 per day, but it is garage parking.